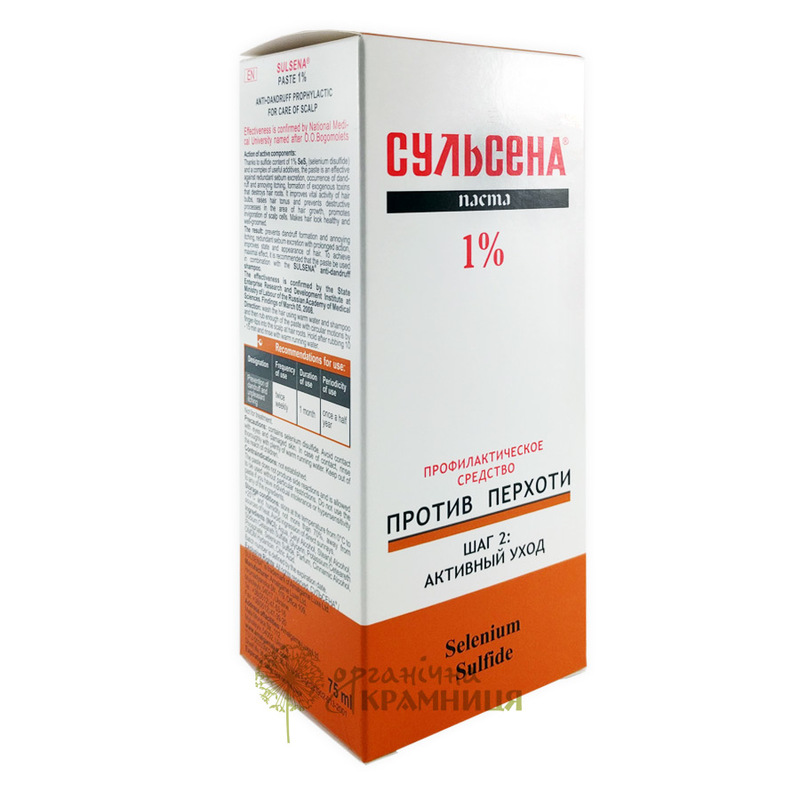 Ukrainian brand Sulsena presents Anti-dandruff Prophylactic Paste 1%. Prevention is the second step on the way to freedom from dandruff and its consequences. The product is based on selenium disulphide, an effective antifungal agent used to treat seborrhoeic dermatitis and dandruff. Selenium disulphide effectively eliminates the main cause of dandruff, a species of fungus named Pityrosporum ovale or Malassezia furfur. Its effect is complemented and enhanced by other active ingredients contained in the product. They help to get rid of dandruff and relieve symptoms associated with it such as increased sebum secretion, itchy and flaky scalp, etc. Sulsena paste 1% is an effective preventive product. If you use it regularly, you will soon forget about dandruff and associated symptoms, and your hair will always look fresh and healthy. The paste has no known side effects and can be used without particular restrictions. Do not use in case of individual intolerance or hypersensitivity to any of the ingredients. The product is not designed for treatment. To treat dandruff, use Sulsena paste 2% with a higher concentration of selenium disulphide. Directions. Wash your hair with warm water and Sulsena anti-dandruff shampoo. Apply some paste to the scalp at the hair roots and rub it in with circular motions. Leave for 10–15 minutes, then rinse with warm running water. Ingredients. Aqua, Cetyl Alcohol, Stearyl Alcohol, Sodium Ceteareth Sulfate, Glycerin, Potassium Ceteareth Phosphate, Selenium Sulfide, Parfum, Cinnamic Alcohol, DMDM Hydantoin, Citric Acid. Want to buy Anti-dandruff Prophylactic Paste 1%? Call us or submit your order via our web site! The popular cosmetic line Sulsena is produced by Amalgame Luxe, a well-known Ukrainian company established in 2003. At first, Amalgame Luxe used the production facilities of the Alye Parusa cosmetic plant in the city of Mykolaiv. In 2007, the company launched its own manufacture and significantly expanded its product range. Today, cosmetic and personal care products produced by Amalgame Luxe are widely popular among consumers in Ukraine and neighbouring countries. The company’s best-known brand is Sulsena, a line of anti-dandruff hair care products formulated with selenium disulphide. Alongside anti-dandruff products, Amalgame Luxe also produces baby creams, anti-acne products, a selection of hand creams (including the company’s famous liquid hand cream), toothpastes, massage creams, and other cosmetic and personal care products for the entire family. The formulations of Amalgame Luxe products are based on the latest achievements in the fields of cosmetology and medicine, which allows to create safe and effective products of the highest quality. Amalgame Luxe is a successful combination of enthusiasm, many years of experience and a high level of professionalism. Its cosmetic formulations are based on biologically active substances of natural origin, which makes it possible to produce cosmetics which meet the most rigorous quality requirements and are able to withstand tough competition.